Nashville, TN -- Don Williams’ legions of fans across the globe have long been hoping, but likely not expecting to hear new recordings from him again. He has been pretty determined to spend most of his time on his Tennessee farm, quietly, with his family— and for over four decades, country music’s “Gentle Giant” has been known for doing what he wants to do. 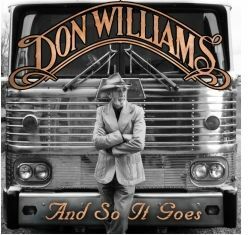 So it’s both exciting and a very welcome surprise to announce the release of the brand new Don Williams album And So It Goes, on Sugar Hill Records, his first since 2004. It is a release very much in the classic Williams mode—mellow yet rhythmic, life-affirming yet thoughtful, serenely masculine, and loaded with singularly strong, memorable songs and consummate vocals.